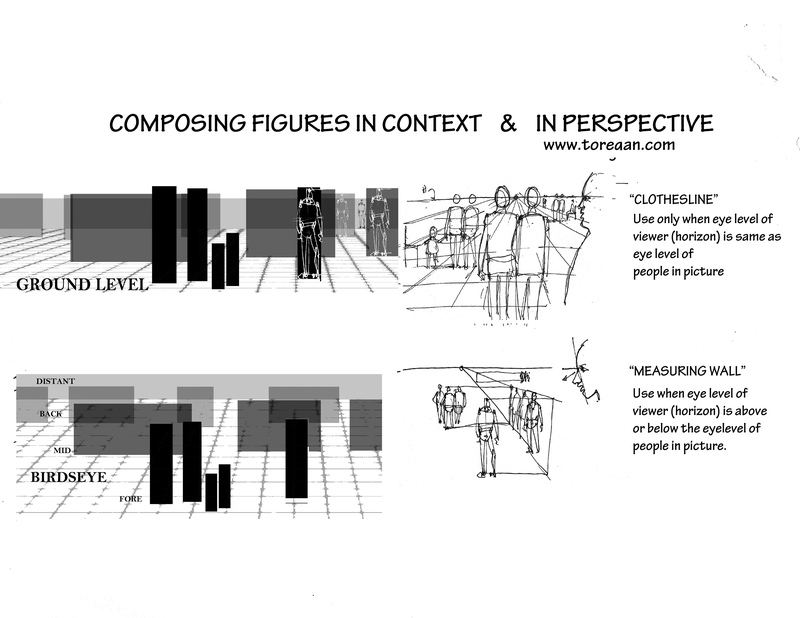 Often you want to place figures and clusters of figures in an area like a street or plaza. This image shows how I think of it in terms of composition. Of course, you also want to think of activities, such as walking to and fro or at angles, male, female, kids, walking away or toward the viewer, standing, sitting, etc., but this is the basic thinking: The figures create ‘plane-blocks’ and between them will be ‘spaces’ or ‘look-throughs’. These need to be arranged in an aesthetically interesting and rhythmically spaced way. I start with the foreground people, then midground, background, and lastly distant planes (if needed). I pay attention to the 3d space-holes (look-throughs) and to placement of feet on the ground plane. Then I think “What can I delete, how should I crop?”. If I am being really careful I will do this on tracing paper so I can move things around before I finalize. Along the way, I use either the clothesline or measuring wall methods, as may be appropriate, to keep the perspective more or less correct. Also, browse around in the “Face and Figure” Category for video demos on drawing scale figures.